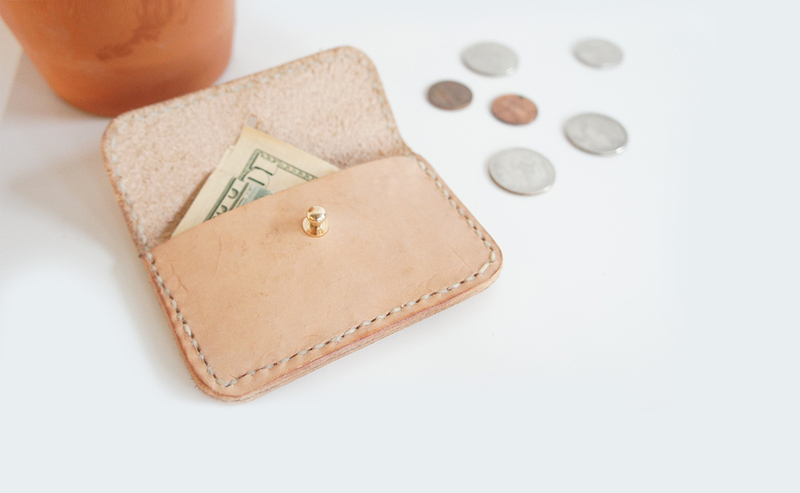 A tutorial on how to create a card and coin holder in leather. I have always loved to explore new materials to work with and create things from. When I moved to Sweden I lived close to a leather supply. I started experimenting with the material and quickly fell in love making small wallets, pouches and other every-day items. There is just something about the way leather gets prettier from the everyday wear and tear. This little how-to guide was made as a leaving present for a colleague and friend of mine. 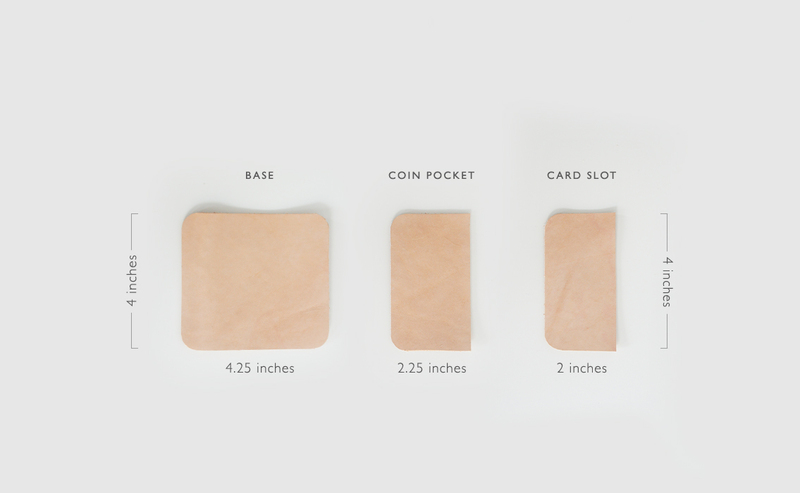 Measure your leather to see the where its best to cut out your pieces. I find it’s easiest to make perfect pieces by cutting a corner of my leather into a perfect 90 degrees angle before you start. To round the corners you should start with laying your quarter as close to the border of the corners as possible. Use your scalpel and cut of small pieces at a time to make a rounded corner. Glue the pieces together by putting a thin layer of glue on the edges of your pieces and press them together. I usually leave them to dry between a heavy stack of books. Take your edge groover and draw about 5mm from the edge around the front of your biggest leather piece. This is to create a groove for your stitches so they look neater, and also to make it easier to place the stitches in a pretty line. The result will be best with and edge groover but if you dont have one you can still use a ruler to draw out a straight line. Start by punching holes in the bottom center of your wallet. I find it easiest to start in the middle and then punch the rest of the holes going side to side. This way you make sure it gets symmetrical and even. When you get to the corners, go as close as you can while still leaving room for one stitch. 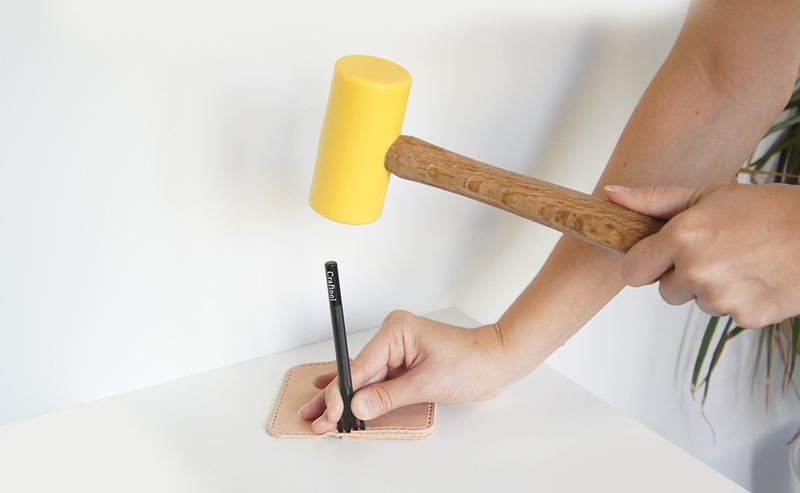 Use your awl to punch through. The result will be best if you place your leather on a hard but soft surface, like a plank of wood etc. Stitch the pieces together using saddle stitches. 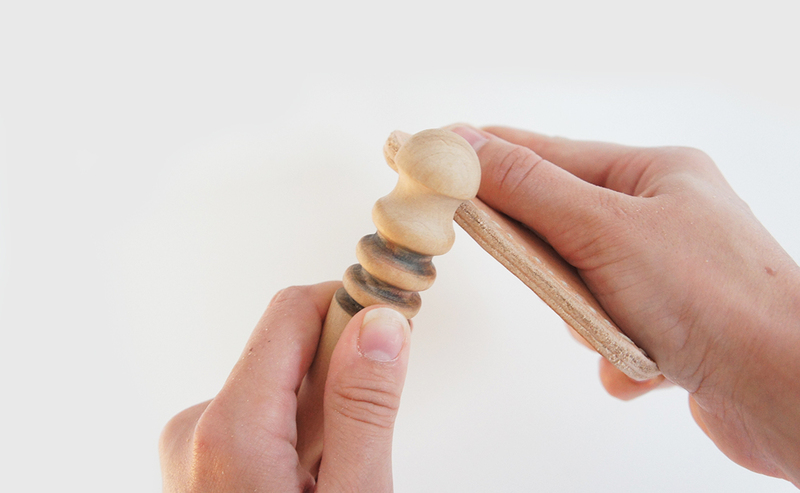 You should sand down the edges to make sure there is no glue residue and that the edges are smooth. Start by using a semi grainy sandpaper and then move over to a smoother one. Slick down the edges by adding some moisture. The best thing you can do is put wax/oil on the edges. Rub the edge slicker back and forth quickly to create friction. 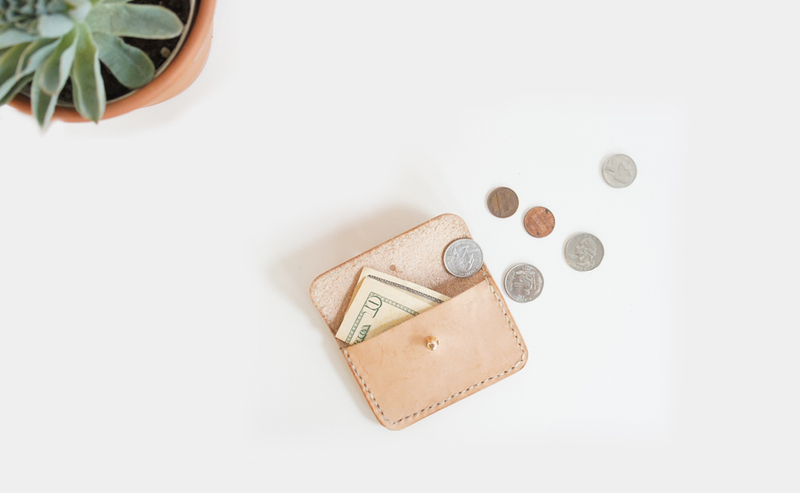 Do a small area at a time and work your way around the wallet. This will smooth down the edge and create a nice finish. 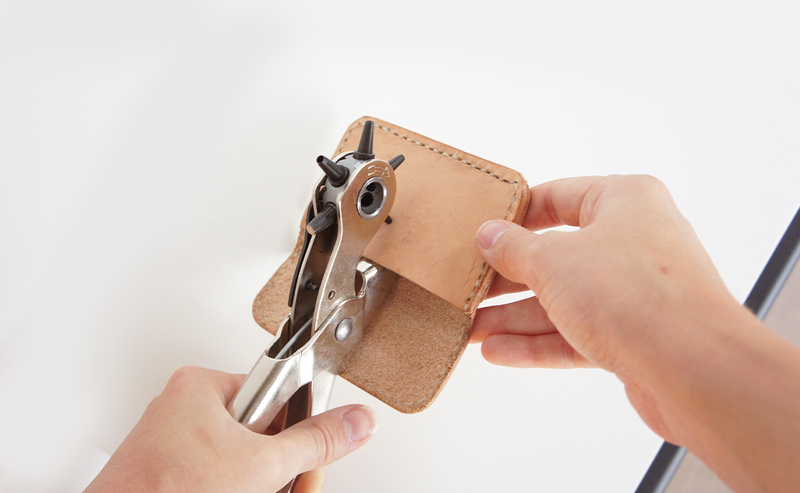 Put a mark on the lid on your wallet where you want the hole for the stud to be. Make sure it is centered vertically. Punch a hole. To make sure its not too big I suggest testing on a piece of scrap leather first. The hole is supposed to be a little small. To make sure it fits the button stud, make a small cut with your scalpel in the center going upwards. 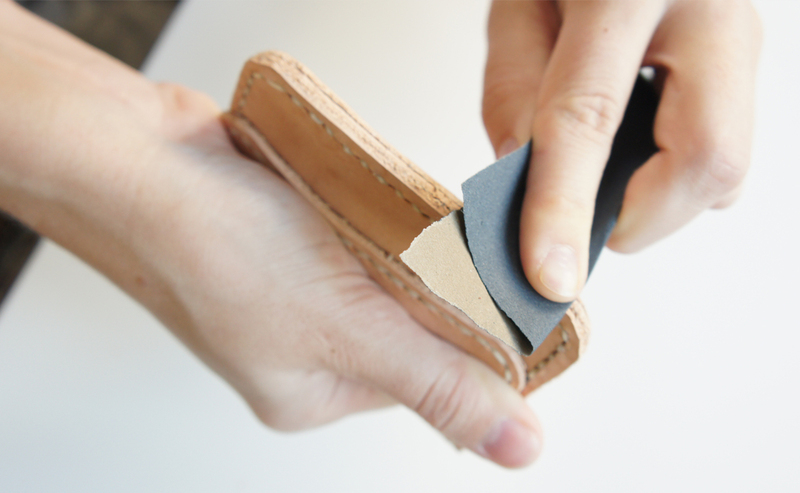 Now that you have the hole, make a mark onto the leather underneath in the center of it. Punch a hole on the mark and place your button stud.